Different pasts, presents and challenges but the UK and Indonesia are both making significant progress toward sustainable futures while Australia continues to fiddle and fume, albeit comically on occasions. No laughs associated with large increases in the numbers of people exposed to malaria, dengue and Zika as a result of changing climate patterns though, and what’s a concerned shopper to choose for carrying the weekly groceries: paper or plastic? On a (literally) brighter note, pictures of Australia’s wrens. While Australia’s two largest political parties and business leaders(??) continue to squabble, vacillate, scaremonger and bend the truth over the perfectly feasible move to 100% renewable energy (RE), some nations are getting on with it. The UK is preparing for an electricity grid powered by 100% RE by 2025; just to emphasise that I have not made a typo here, that’s 6 years away. Of course there are challenges not simply with the generation and storage of the electricity but also with its distribution and retailing, all of which will require re-design of the overall structure and the engineering and marketing aspects of the system. But in the UK it seems to be a desirable, do-able challenge rather than a threat and an opportunity for mud-slinging. Closer to home, in Indonesia (the world’s 4th largest greenhouse gas emitter) the government’s Low Carbon Development Initiative has predicted that more efficient energy systems can cut greenhouse gas emissions by 43% by 2030 while simultaneously increasing GDP growth, employment and incomes, reducing poverty, and avoiding 40,000 deaths per year from air pollution. Strategies proposed include increasing RE’s share of power generation to 30% by 2045, enforcing moratoriums on forest destruction and mining, tripling reforestation, and meeting national and international targets for water, fisheries and biodiversity conservation. Indonesia has a GDP per head approximately 1/14th that of Australia and this emphasises the point that Australia, a rich country that has benefited and got rich from the mining, sale and burning of fossil fuels, should be leading the way in the move to a zero carbon economy, getting there by 2040, so that developing countries such as Indonesia have some leeway in their timetable to become zero carbon. Australia also has an obligation to help developing countries with technology and finance to make the transition, not being miserly and stopping our contributions to the Green Climate Fund. It’s easy to see that extreme weather events associated with global warming cause injuries, illness and death. Less well known is that long term changes to climate patterns are likely to lead to more cases of insect-carried diseases such as malaria, dengue, Zika and yellow fever. These diseases are caused by complex interactions between the weather, the landscape, the microorganism that causes the disease, the insect that carries it to humans and humans themselves. A recent modelling study suggests that an additional billion people could be exposed to vector-borne diseases over the next 50 years. And they won’t only be people in tropical or rural areas or developing countries. Residents of cities in rich countries outside the tropics will be exposed. Nations and health services need to plan for these changes. Single use plastic bags bad, paper bags good, right? Well, it depends on whether you are focusing on waste or climate change, and how often you use the bags. Even reusable plastic and cotton shopping bags are sustainable only if you use them many times. And what you put in the bag is more important for greenhouse gas emissions than the bag itself. 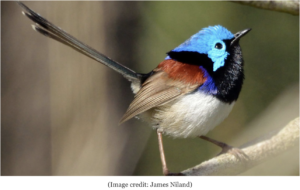 Because I’m going bush this weekend and to provide something nice for you to look at, here’s a picture of a gorgeous variegated fairy wren. For pictures of more of, and a guide to, Australia’s fairy wrens have a look at this article from Australian Geographic. The Adani mine has always been a creature of the Liberal Party. From the day Deputy PM Tim Fischer signed an Economic Agreement with India which, although cancelled in 2017 by India, committed Australia to the agreement until 2032. In August 2010, Adani bought the Carmichael mining rights from Linc Energy, now defunct, whose founder and Managing Director, Peter Bond, was a major Liberal Party donor. The mining proposal was approved by Greg Hunt in 2014, and the project became official. That approval was subsequently overturned by the Federal Court, then re-approved. That faulty approval was endorsed by another faulty approval by Environment Minister Price, who has now passed the buck to the Queensland Labor Government. In a nutshell, the whole sorry affair is a concoction of corrupt businessmen and LNP politicians. Adani is part of the LNP’s DNA, and the LNP has weaponised this environmentally destructive and economically indefensible project. Labor’s position is almost impossible. Whatever they do, the Adani mine will blight Australia for a very long time.